But all russian AAA systems have the capability and are used to fire at ground targets. The 2S38 won´t be an exception. LMFS wrote: Guess that AA-specific vehicle would not be the T-15 but some lighter, cheaper one with more ammo. The latest fighting vehicle fire support "Terminator 3" based on heavy tracked "Armata" platform will receive as the main armament just two 57-mm automatic cannon. Information about this is available in the blog of the famous Russian historian and expert Alexei Hlopotova tank. He, in turn, as a primary source refers to the book "Ural Railway Car Plant 80 years" S.V.Ustyantseva. Also doubles powerful 57-mm guns, advanced anti-tank guided missiles will be installed in "Terminator 3". Perhaps it is a third-generation products, which operate on the principle of "shot - forgot", ie, have a homing systems. Military experts ambiguously received this information, there is the opinion that weapons of "Terminator 3" is redundant and one 57-mm gun on the combat unit "Baikal" type would be enough. In any case, the new version of the combat vehicle fire support firepower will not be equal. I just see the levels of protection and firepower in a T-15 more than sufficient, given the advantage in numbers they would count on, compared to specialised variants. Basic rationality would mean avoid developing the BMPT-3 if it is not necessary. But of course, Russian military may see it different and I would not complaint! Not sure the BMPT-3 would double as AD variant though, is that what you are saying? The thing with the unified platform Armata is that you can easily develop new versions. The BMPT-3 (T-17?) will supplement the T-15. Both vehicles will have optics and radars (for the APS) and data-link so they could also be used in air defence with the help of a decent radar vehicle. Hole wrote: The thing with the unified platform Armata is that you can easily develop new versions. The BMPT-3 (T-17?) will supplement the T-15. Both vehicles will have optics and radars (for the APS) and data-link so they could also be used in air defence with the help of a decent radar vehicle. You cannot let a BMP-2 to face the threat of antitank crews, even if only armed with RPGs or even heavy machineguns / small calibre cannons. And its firepower is also not enough against strong fortifications. A BMPT makes complete sense to complement it. But with T-15 this is more questionable. The radars for the APS... maybe I am wrong but I understand their design is not meant for AD at all, are they expected to operate as fire control for the cannon? But in any case yes, the new 57 mm reinforces the organic AA capacity which is a very powerful resource against PGMs, UAVs, helos etc. as illustrated in its thread. There are several turret designs... one is the AU-220 or whatever designed to replace the turret on a PT-76 amphibious vehicle. Another is to be used in air defence units and does not have any missiles on it it appears. The third is the one with Ataka missiles on it and it is intended for mounting on the Armata, the kurganets, and the boomerang as a turret for an IFV. 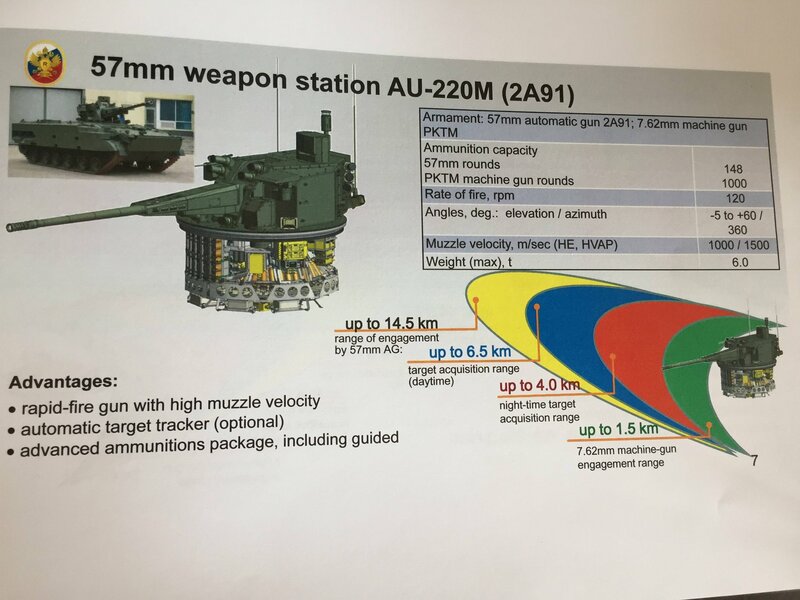 The second one with EO sensors but no missiles will also likely be mounted on armata, and kurganets and boomerang chassis, but will be used in air defence units like they currently use BMP-2s with gripstocks for MANPADS inside. Remember the job of an IFV is to have a main gun armament able to deal with anything on the battlefield except tanks and to engage tanks with ATGMs... to reliably penetrate modern NATO IFVs (some of which weigh 32+ tons with heavy armour) requires a gun that is rather more potent than a 30mm gun. With BMPT ideas, I suspect the practise will no longer be needed in the future however. My understanding of the radars on the armata is that it is short range for detecting incoming threat for the afghan APS system. An air defence vehicle would operate with other vehicles with missiles... no doubt TOR and Pantsir etc, so good EO systems and a datalink to nearby vehicles should actually be plenty without making it too expensive. Ironically the concept of a BMPT is a vehicle with an armament optimised to deal with threats other than enemy tanks... but that pretty much describes the armament of an IFV with tank level armour. So the one shown on the Armata chassis was the top version, minimal hull penetration and 80 rounds, the one on BMP3 chassis is full penetration with 148 rounds. Is this one a radar antenna? Its tilts vertically but its fixed in azimuth & small so its not a search radar, I presume its something like a ranger/shell tracker. Oh!Thank you!This is what I ask. Google Translate wrote: The Ministry of Defense has approved a new concept for the development of armored vehicles. For all light combat vehicles (infantry fighting vehicles, armored personnel carriers and armored cars) a new maximum caliber is chosen - 57 mm. Such guns are strong in their versatility. They can not only destroy tanks, but also shoot down drones. Their rate of fire can be compared with a machine gun. So far, only Russia has been able to bring such weapons to mass production. Light armored vehicles with 57-mm cannons will gain an advantage over other combat vehicles of the same class. The Defense Ministry told Izvestia that a new concept for the development of armored vehicles was approved this year. Before making a decision, development work was carried out, which confirmed the feasibility of arming such machines with 57-mm guns. 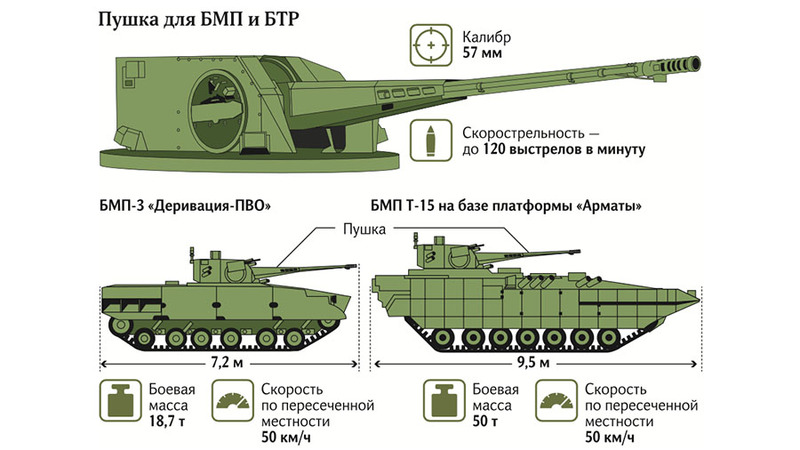 Now the BMP and BTR, as a rule, install 30-mm cannons or 100-mm guns - launchers. Local wars and armed conflicts of recent years have shown that existing weapons are not always effective in the fight against high-speed or armored targets. 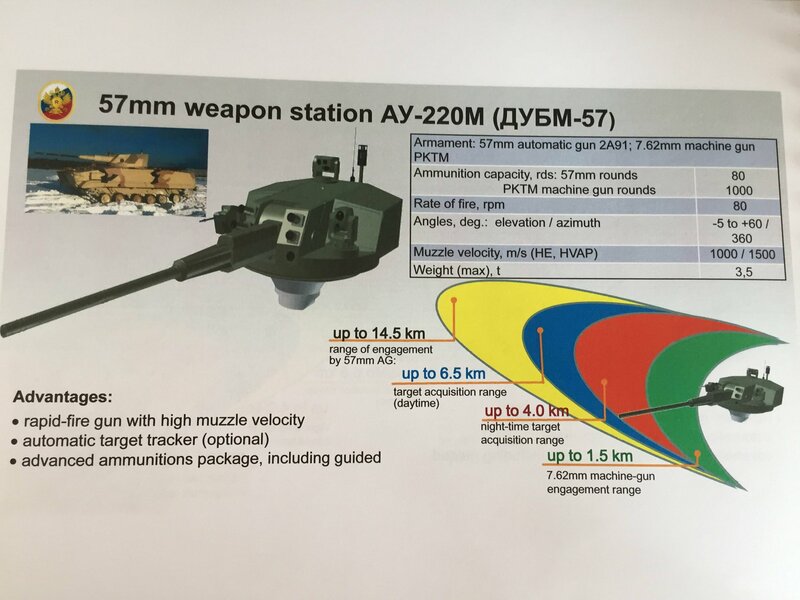 A more powerful 57-mm cannon will allow the Russian light armor not only to easily cope with infantry fighting vehicles and armored personnel carriers, but also, if necessary, to engage in combat with any of the existing tanks of the likely enemy. She can sweep away the sights of fire, thermal imagers and other external equipment, or hit such a protected tank as the Abrams on board. Increasingly, on the battlefield, the main target for the crews of armored personnel carriers are not enemy tanks, armored personnel carriers or infantry fighting vehicles, but lightly armed jeeps or air drones. Such targets must be destroyed at the maximum distance, using the minimum amount of ammunition. Light infantry moving on “carts of the XXI century” cannot be allowed to be the first to use anti-tank guided missiles (ATGM). Drones - to transfer intelligence to your command post. The domestic defense industry complex has already developed a technique that meets the latest requirements for combat. The BMP-3 and BTR-82 can be armed with a 57-mm automated remote-controlled artillery module AU-220M "Baikal". His gun has a high rate of fire - up to 120 rounds per minute. The same gun can be mounted on a heavy tracked BMP T-15, created on the basis of "Armata". For her, a combat uninhabited module "Dagger" has already been developed. His gun can shoot at a distance of more than 14 km. Guns of 57 mm caliber have long earned a reputation as reliable anti-aircraft guns. In the USSR, the ZSU-57-2 anti-aircraft self-propelled guns were used, which were used in the Vietnam War, the Arab-Israeli wars and the Iran-Iraq war. At that time, the ZSU was supposed to destroy jet aircraft, but due to the lack of automated radar guidance devices, this machine did not differ in high efficiency. Domestic defense industry and solved this problem. 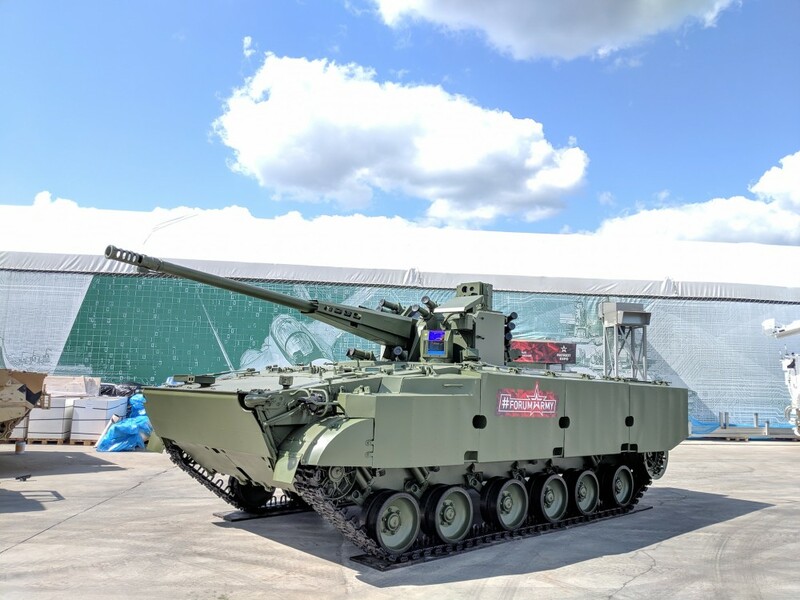 A promising self-propelled unit "Derivation-Air Defense" with a 57-mm gun, which is made on the BMP-3 chassis, will become a dangerous enemy for helicopters and attack aircraft. For it, a 57-mm projectile has been developed and is undergoing tests that will be able to destroy low-profile and low-flying targets such as tactical UAVs or rocket launchers of MLRS, cruise missiles and other high-precision ammunition. The new guns will increase the firepower of the Ground Forces, says military expert Sergei Suvorov. “In the modern war, the one who quickly accomplishes his fire mission will win,” he told Izvestia. - 57-mm caliber greatly improves this figure due to greater accuracy, damaging effect and higher armor penetration than the existing 30-mm guns. This should ensure for years the superiority of domestic technology over the latest BMP and BTR armies of the leading countries of the world. For example, the German heavy BMP "Puma", entered service with the Bundeswehr in 2015, is armed with only a 30-mm gun. I wonder when there will be an order for new/conversions? Interesting idea, but the low muzzle velocity gives the gun a relatively short range of 2-3km only. I rather think that the gun would be ideal for use on light unmanned vehicles and also as a replacement for the 30mm cannon on some light platforms where the enemy does not have armour like in COIN operations. Ideal for enemy infantry suppression like use against snipers or machine gun positions or indeed ATGM teams. The low recoil means light vehicles could carry it, and the relatively small ammo could be carried in enormous volumes... it has ammo commonality with late model Hind helos that have twin 23mm guns in chin turrets on the latest model. 30 or 40mm grenade launchers and rifle calibre machine guns and HMGs would compliment this gun for light an unmanned vehicles. This twin barrel 23mm cannon is also widely used in Soviet and Russian gunpods and seems rather popular. It might even transmit a command to detonate a round as it gets near its target as tracked by that antenna (ie tracking both the outgoing shell and the incoming target). Or it might track the outgoing shell to track its trajectory and speed and update the fire control system to allow for that to improve accuracy in real time. 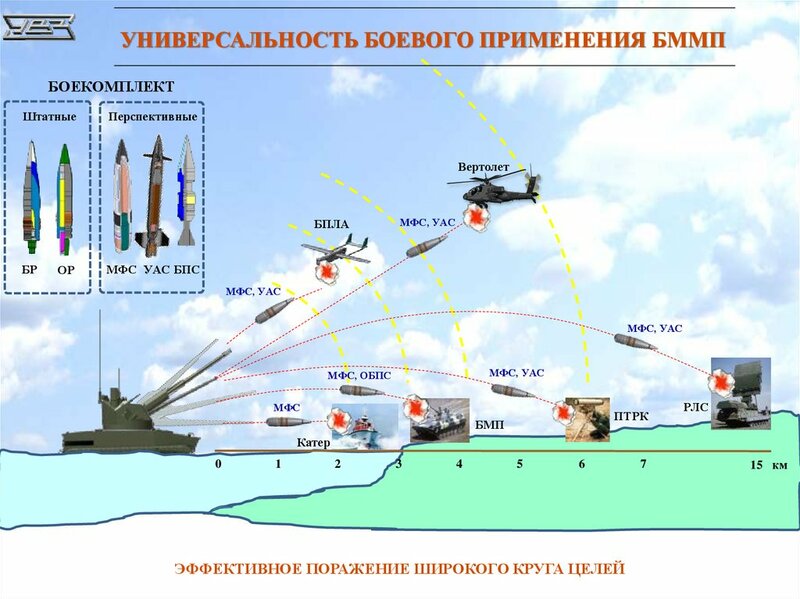 But I have seen ground radar that size that could track targets out to about 10-15km, so it should be able to track targets and outgoing shells out to the 14.5km shown in the poster. Why are they talking like its brand new footage? Are you tired of seeing "big" guns in action? So, can be a 57mm shell be guided to destroy aircrat, UAV and other airbone target? Maybe, maybe not, I think is probably too small but it can at least get a modern smart-fuze. Pardon? What is so off the mark if I may ask? 57 mm cannon have been used since always in AA role and now smart ammo can multiply its effectiveness unless I am missing something ? If it has a shell casing it's used strictly on infantry. Left group is the existing old AP & HE rounds I think. On the right seems to be smart-fuzed HE, guided (hollow-charge?) & APFSDS. Are they confirmed to be making those? Obviously not against fast jets & fairly low chance vs helicopters but I think its pretty clear from Donbas/Syria/Iraq that a cheap & reliable method for taking out relatively slow & small drones is very necessary. A 57mm smart-fuze round should be significantly cheaper at that than missiles. In the stats for the turrets posted above it mentioned 1,000m/s for HE rounds and 1,500m/s for AP rounds... the old ammo was fired in mixed clips so no chance to adjust aim during firing so the HE and AP rounds had to have the same trajectory otherwise one round type would be hitting the target and the other would be wildly going off in a different direction. The whole purpose for using 57mm calibre was for the extra space that allowed guided rounds to be developed. Yes, it says HVAP on those stats, has to be meaning the APFSDS shown in the new pic. HVAP was a WWII type, there was 1250m/s HVAP for the WWII 57mm anti-tank guns but just the 1000m/s APCBC for the cold-war S-60 the new gun is based on.